See the latest version of this recipe Here. Lotus roots signify abundance and peanuts signify wealth. That is why lotus root soup or 莲藕汤(Ling Ngau Tong/Lian Ou Tang) is a MUST have soup during the Chinese New Year. 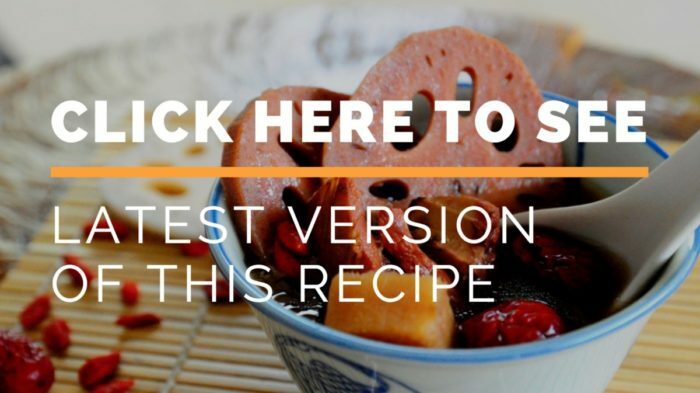 Besides, in Chinese medicine, lotus roots are also known to have many benefits like strengthening the body, dispelling heat and improving one’s appetite. Hence, it’s a popular soup among the Chinese. Lotus roots signify abundance and peanuts signify wealth. 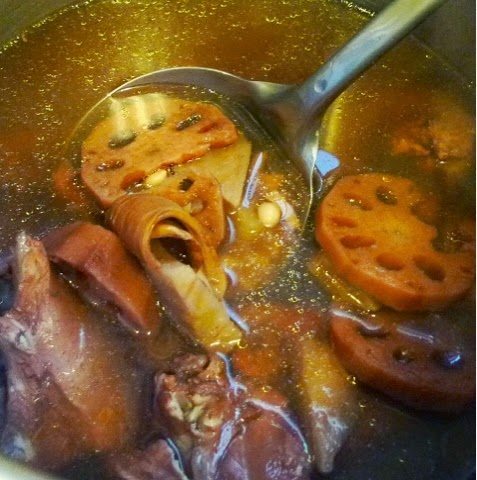 That is why lotus root soup (莲藕汤) or Ling Ngau Tong is a MUST have soup during the Chinese New Year. In Chinese medicine, lotus roots are also known to have many benefits like strengthening the body, dispelling heat and improving one’s appetite. Blanch the chicken pieces in boiling water. Discard the water and set the chicken aside. Heat up a soup pot of water. When boiling, add the chicken pieces and all the ingredients. 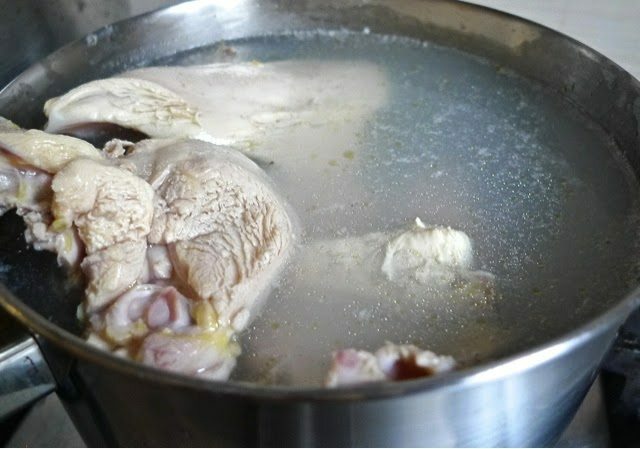 Bring to a boil, then reduce to medium heat and simmer the soup over low heat for about 1 hour, or until the chicken is fully cooked and lotus roots and peanuts are tender. Blanch the chicken pieces in boiling water. Set aside. In the pressure cooker, add the lotus roots and all ingredients including the salt. Bring to a boil ( high heat ). When pressure cooker sounds, reduce the heat to low and cook for another 15 minutes. Then turn off heat. Wait for pressure to be released and it’s ready to be served. 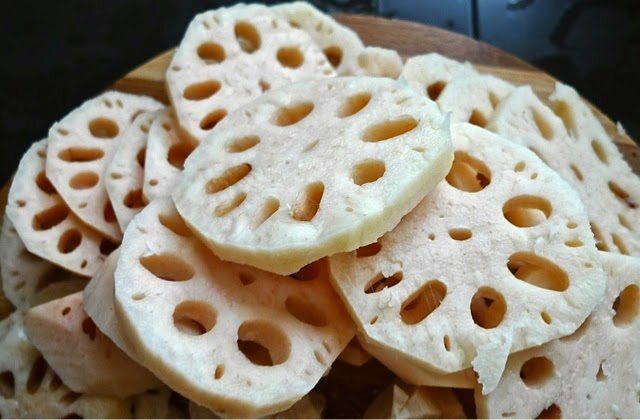 Lotus root is a popular vegetable throughout Asia …. not so still in the west. 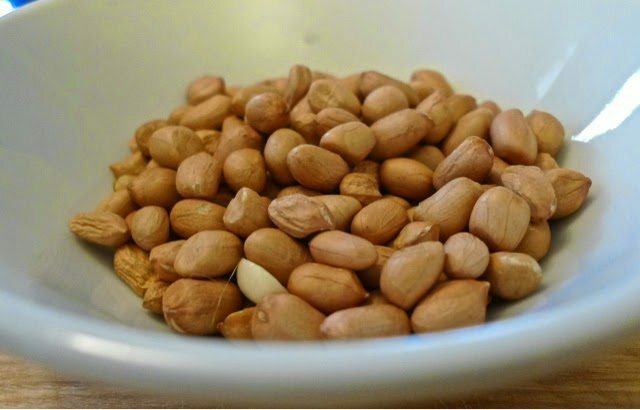 It is full of fibre and various vitamins and nutrients. A nice fresh lotus root is light orangey – brown in colour. 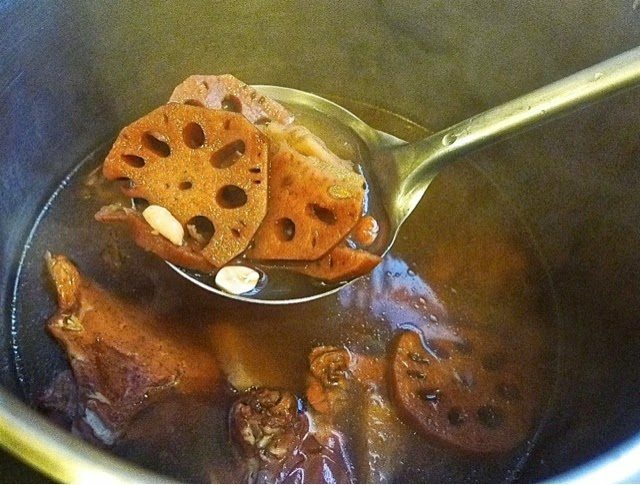 The lotus root is skinned and cut into pieces before cooking the soup. Visually it’s very appealing with all those little holes. Arrowroot is added for extra sweetness. 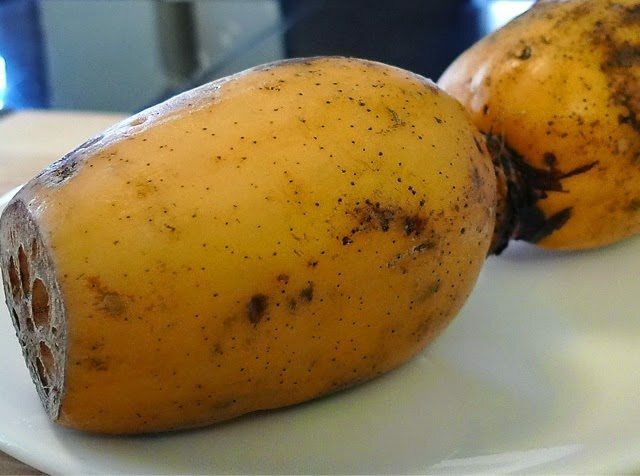 It is a type of tuber roots in the yam and taro family. 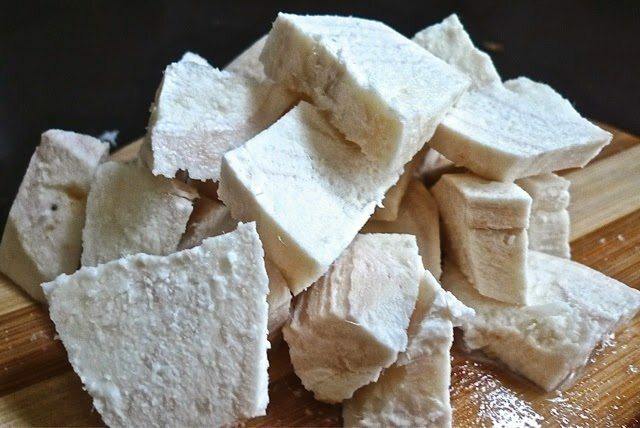 Arrowroot is skinned and cut into big chunks. 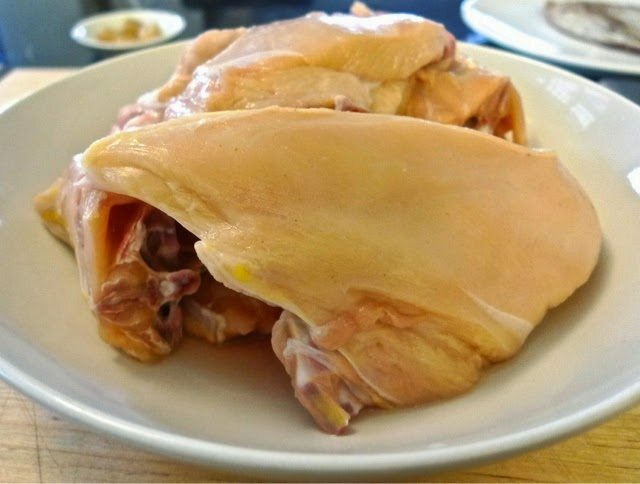 The chicken pieces is blanch in boiling water before use. 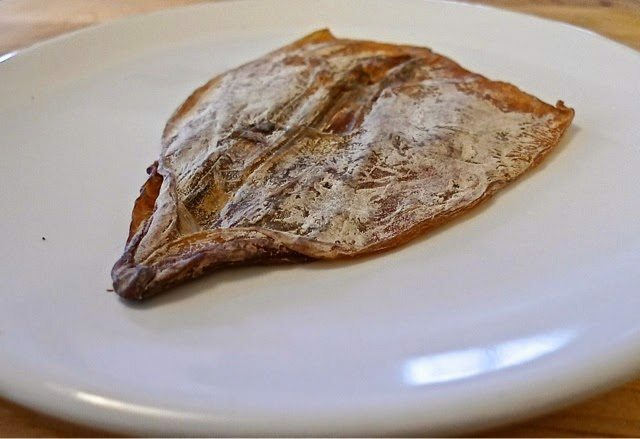 Dried cutterfish is added in the soup for extra flavour. It is washed thoroughly, soaked in water for about 10 minutes and cut into strips before adding into the soup. Lotus root with peanuts is a great pairing for this soup. 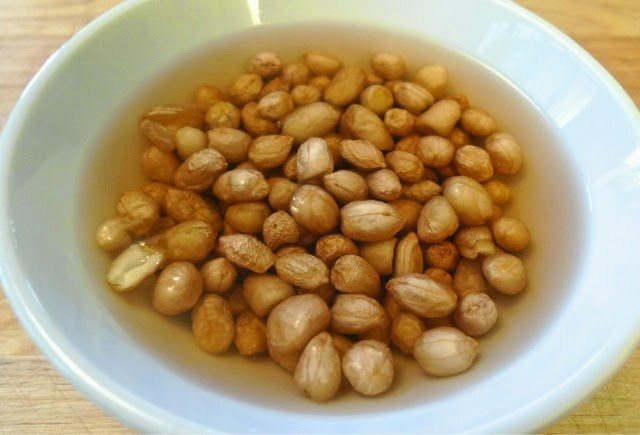 Soak the peanuts in warn water, then remove the skin before adding into the soup …. this will ensure a clear broth. Wolfberries / Goji are soaked in water before adding to the soup. Their benefits have been known for thousands of years by the Chinese. They are not only loaded with minerals, vitamins and anti-oxidant, they have natural immune system boosting properties too. Dried scallops are washed and soaked in cold water before use. By adding scallops to the soup, salt can be reduced as they produce enough flavour. 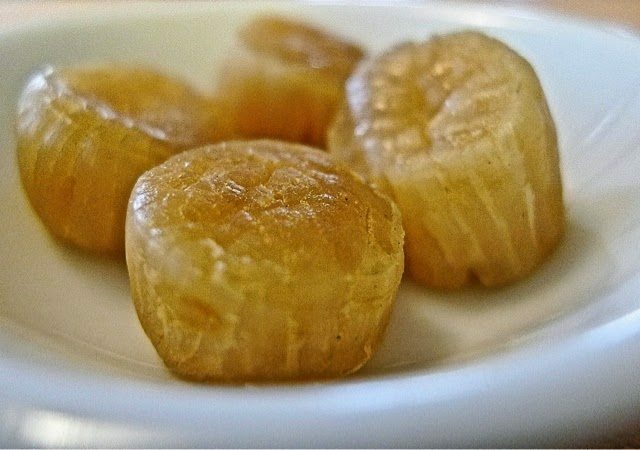 Dried scallops are beneficial to the “yin” and replenishes the kidneys. Red dates are washed and soak briefly in water before adding to the soup to make it sweeter. Also known as jujubes, they are widely considered as the ” living vitamin pill” by the Chinese. It contains Vitamins B,C,E,P, phosphorus, calcium, iron and ….. more. The soup is best served hot immediately after cooked. Certainly a simple, yet a delicious and nutritious Chinese soup. … Daughter Miko says it’s Yummmmmmy. It may take a little time to prepare and to cook, but the results are DEFINITELY worth it.